Please import the model to Signavio and view it in the editor. Then, select „Simulation” from the drop-down list in the upper right corner. To start the step by step simulation (1), press the „Play” button (2). When you run the simulation, you can see the process flow – blue arrows (on transitions) or borders (on jobs, goals, and other items). If the arrow or border is filled, the transition or task is completed. If it is not completed – it is planned to be executed next. To perform a task or transition, click on the arrow or border. When the XOR is reached, the border appears on more than one transition. In this case, choose one of the flows that the process can follow – by clicking on one of the transitions. When you reach the AND gate, the border appears on several tasks – in this case, each of them must be completed. To prepare a simulation other than „Step by step”, you need to prepare a scenario. To do this, scroll down to the „Scenarios” section. The cost of the „Book tickets and hotel” and „Pay for travel” tasks due to external intermediaries is € 0.05. All other tasks do not involve additional costs. Frequency of „Travel request submitted” to 75 times a week (15 times a day, assuming work from 9 am to 9 pm). Probability of the time event on the Validate booking task: 2%. The simulation of a single case (1) is started by pressing the „Play” button (2). Select one of the scenarios (3) that you created, and select whether to run another process instance („Loop”) or „Single run” (4). 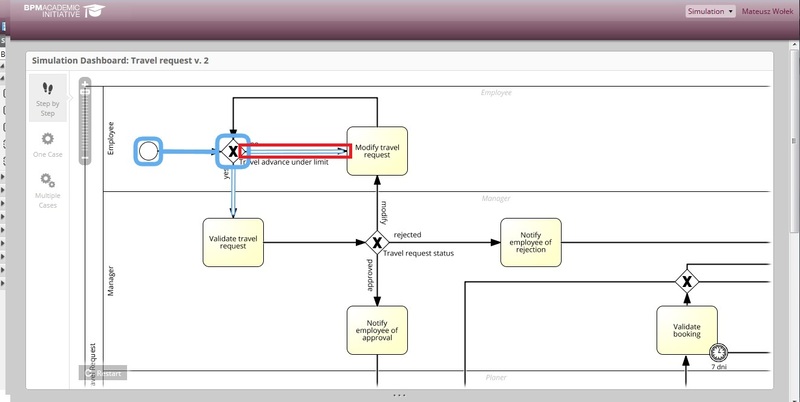 In the case of this simulation, there is no need to skip further tasks and flows. In case of tasks, it is done automatically. In the case of sequence flows, it is possible to manually select the path on the gate, and if we do not do this within the time set by the clock (1), the selection will be drawn according to the probabilities defined in the scenario. On the left, there is a panel (2) showing the current cost and execution time of the process instance, resource usage time, and bottleneck if it has been detected so far. On the other hand, when we run the next run, we get the result of the last run. Simulating multiple runs for the selected scenario is started as before using the „Play” button. The new element is „Duration” (1), in which we choose how long the simulation takes. After the simulation for each task or event, you can see how many instances of the process were executed. You can also see how many tasks in different instances of the process have been completed and are waiting for execution (1), as well as how many tasks are currently being performed in the task (2). You can also see how many requests for a business trip have been finalized as rejected (1) or accepted (2) and generate a simulation report (3). Please perform the multiple case simulation several times following the described scenario for the duration: 30 days. Then, compare the simulation results, analyze them and generate a simulation report. In the groups, discuss the conclusions of the simulation. The frequency of the „Travel request submitted” event will increase to 100 times per week. The company may employ one additional person with a salary of 20€/hour. In the company you can transfer funds up to 10% for each resource. You can propose the changes in the number of human resources and their working time (as far as possible, these should be cautious decisions, as employees do not perform only this process). In particular, the company board will reluctantly attempt to change the number of employees who work in other processes. break up tasks into smaller ones or grouping some tasks into larger ones, but the total time for such a grouped task must be the same as the sum of times of the original ones. The bottlenecks in the process should be minimized i.e. it must be possible to run the simulation for a minimum of 90 days. you can include relevant charts/graphs illustrating the scope of improvement of various process parameters with the changes introduced. The report should be convincing and understandable to a person who does not know the tools for process simulation. the automatically generated report from the simulation in Signavio.